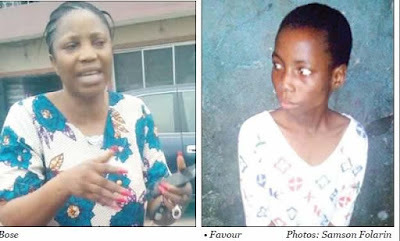 A housewife, Bose Ogedengbe, has been arrested by the police for allegedly brutalising her ward, Favour, at their house on Bush Street, in the Anthony Village area of Lagos. Bose and Favour are from Akoko Edo in Edo State. The victim’s father, a farmer, had reportedly handed her over to Bose’s husband, a relation, a year ago. The woman reportedly brutalised the Junior Secondary School two pupil of Mende Junior High School for allegedly taunting her about her childlessness. The 13-year-old was rescued by residents of Ajose Street, Mende, Maryland, where she ran to. One of those who rescued her, Wasiu Ismail, an aluminium fabricator, said the victim was found around 6.30am on Friday on the street. He said, “Around 6.30am on Friday, an elderly man who lives on this street brought the girl. He said he saw her with blood all over her body. Ismail said when the victim was queried on the reason for her being beaten, she claimed that she had washed some clothes the previous day. According to him, the 13-year-old said she had gone to remove the clothes from the line but some of them had yet to dry up. Bose, on discovering that some of the clothes were still wet, allegedly became angry and brutalised the victim. “I asked if she wanted to go back, but she said she could not because the woman, who she called her aunt, would kill her,” he added. The Punch learnt that Bose later arrived on the street in a car with some men and attempted to take the victim away, but was resisted by the residents. The guardian was alleged to have further brought a policeman from the Anthony division, where she had reported a case of a missing person. Again, the residents stood their grounds. A student, Suleiman Habeeb, said they refused to release the teenager because they feared she might be returned to the guardian. A correspondent, who sighted the victim before she was whisked away by officials of the Lagos State Youth and Social Development, observed fresh and old torture marks on her. “We told the woman not to think that she could use the police to harass us. We called different emergency numbers of Lagos State and sent distress calls to government agencies. Some youths wanted to beat up the woman, but we cautioned them. We are happy that the government has now taken over the case and we hope justice will be done. “We want the government to take action against the woman. If you cannot take care of a child, return her to her parents and do your domestic chores yourself,” Habeeb said. When The Punch approached the suspect, she declined comment. The Director, Public Affairs, Lagos State Ministry of Youths and Social Development, Adeola Olabisi, said the victim was in the custody of the government. The state Police Public Relations Officer, CSP Chike Oti, promised to call back, but had yet to do so as of press time.